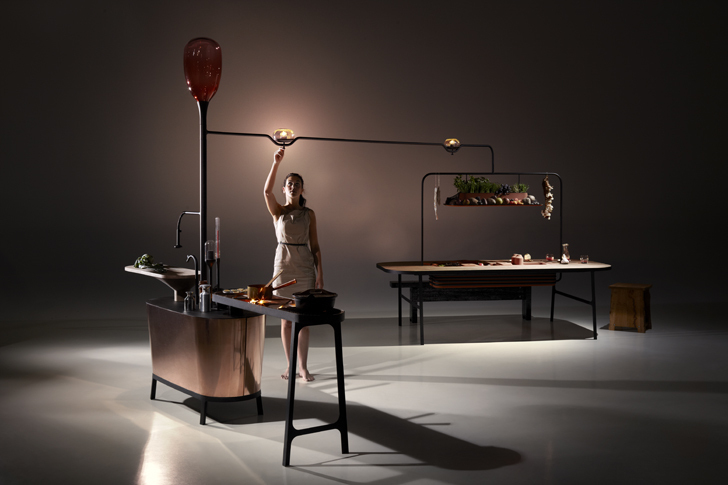 <a href="http://www.ddw.nl/event.php?eventID=cde2836612a8fef6fbdb4909d70afb30" target="_blank">Dutch Design Week</a> began last week, and Netherlands-based firm <a href="http://www.usa.philips.com/" target="_blank">Philips</a> got a head start garnering attention with its innovative new Microbial Home. 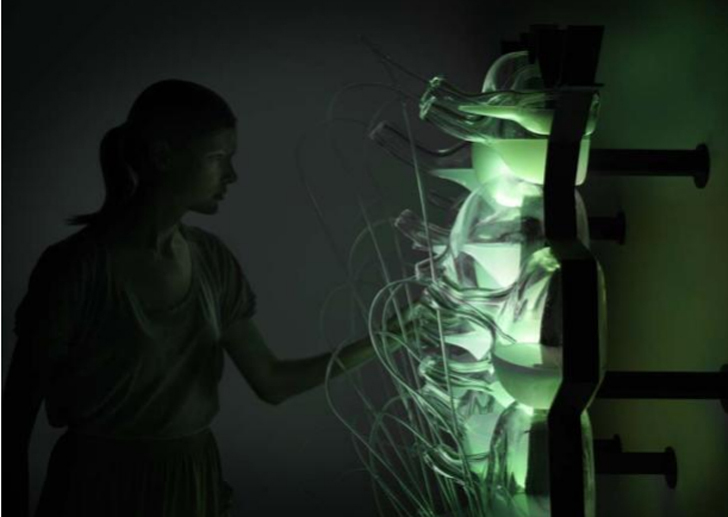 The firm showed five designs (including some rad bacteria fueled lamps!) that make up an entire eco-home that uses zero energy at the <a href="http://www.pietheineek.nl/en/artgallery" target="_blank">Piet Hein Eek Gallery </a>for the week. These ultra sustainable designs are sure to change the way we think about waste, energy, and recycling. The main hub of the<a href="http://en.wikipedia.org/wiki/Microbial_fuel_cell" target="_blank"> Microbial</a> home is the Bio Digester Kitchen Island. It converts solid human and vegetable waste into methane gas that powers the rest of the home's functions. The island includes a chopping surface, gas stove, a glass tank that shows energy levels. The incredible Bio Lights are fueled by the power of methane as well. The "Bio-gas" is made by collecting and burning the gasses bacteria living upon the waste give off. The lamp is a series of hand blown glass cells inside steel frames. 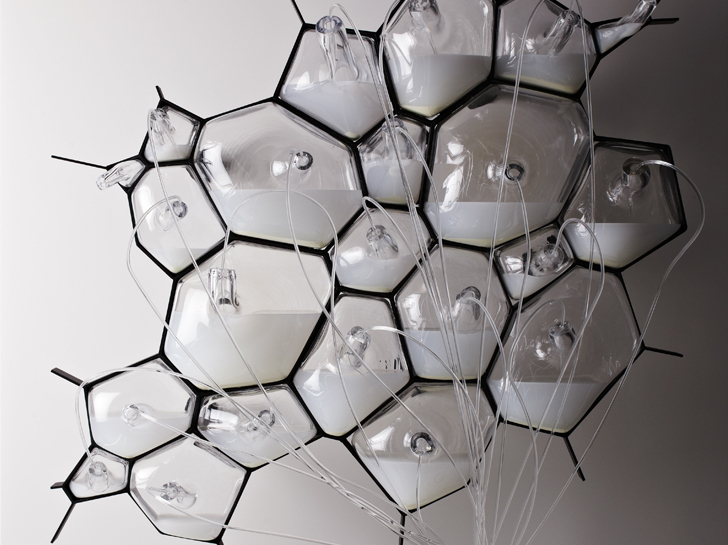 Each cell is connected to it's methane food source by tiny silicon tubes, resembling a bouquet of glass balloons. The food source can also be replaced with <a href="http://en.wikipedia.org/wiki/Green_fluorescent_protein" target="_blank">fluorescent proteins</a> that emit different shades and colors. 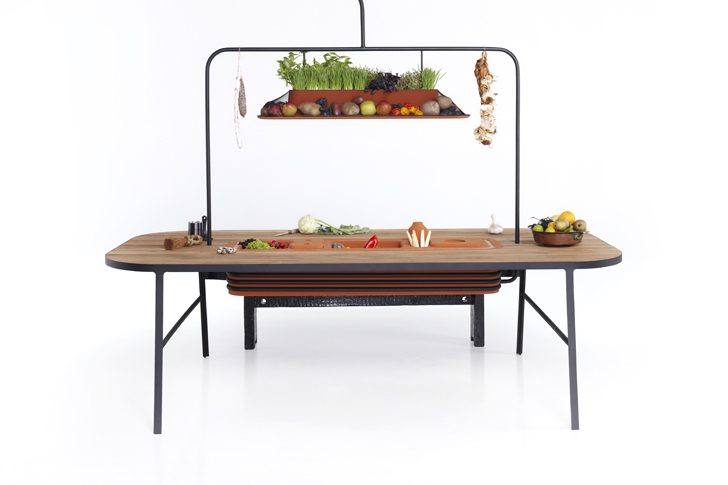 The Larder concept is a central gathering table where food is stored to keep fresh and cold. 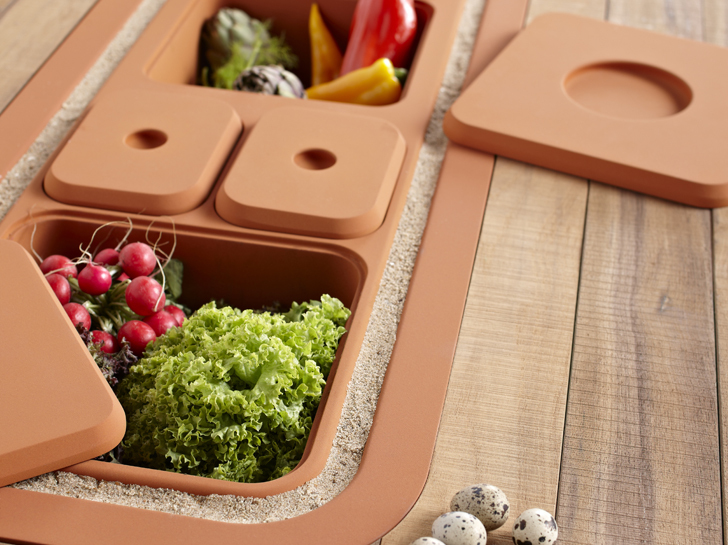 The recycled wood table includes a number of built-in terra cotta evaporative boxes to store fresh meat and veggies. Each box varies in thickness to accommodate different food's needs. The table's outer surface is heated by hot water pipes, warmed by the central Bio Digester's methane source. Plants grow in ceramic pots above, to encourage local sourcing. 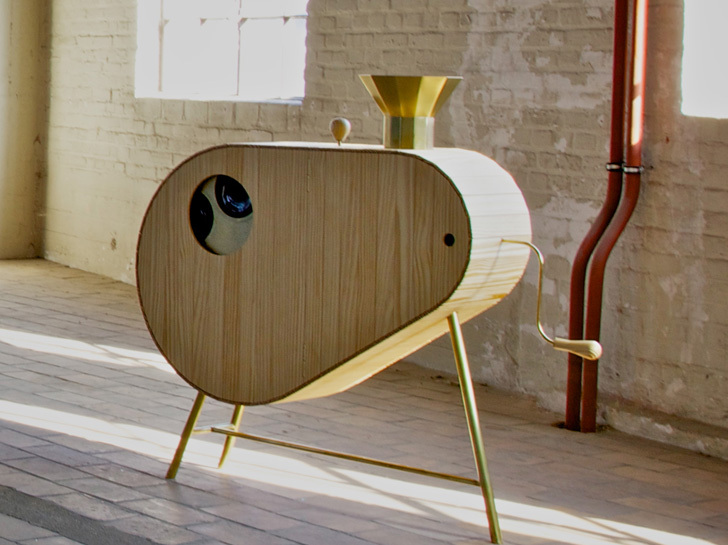 The Paternoster Plastic Waste-Upcycler is another awesome invention that will be displayed in the Microbial home. It uses <a href="http://en.wikipedia.org/wiki/Mycelium" target="_blank">mycelium</a> (that's right, fungus) to break down plastic packaging and waste. It molds the plastic into toy shapes for kids and even produces edible mushrooms! Lastly, Philips has built a throne to the source of the methane powered home. 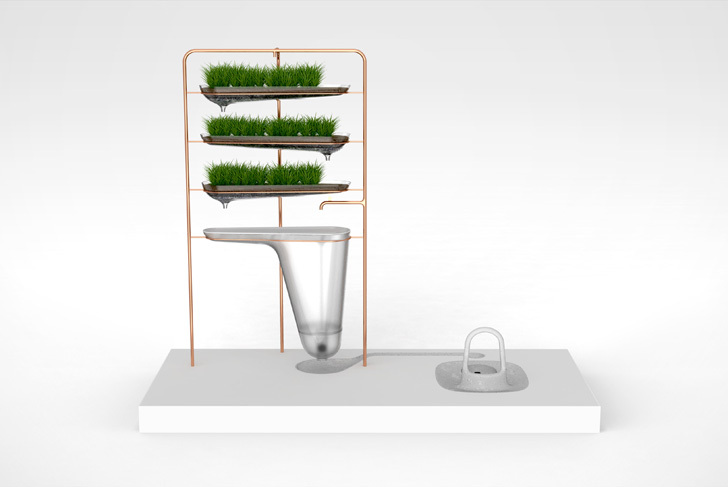 The Filtering Squatting toilet separates liquid and solid waste, filtering the first to water to help grow plants and channeling the other to the home system to convert to methane. It utilizes the 1 liter flush toilet technique, consuming no energy at all. Dutch Design Week began last week, and Netherlands-based firm Philips got a head start garnering attention with its innovative new Microbial Home. The firm showed five designs (including some rad bacteria fueled lamps!) that make up an entire eco-home that uses zero energy at the Piet Hein Eek Gallery for the week. These ultra sustainable designs are sure to change the way we think about waste, energy, and recycling.